Of course I am not driving a car. I don’t even like sitting in a taxi. I love the subway. Not only in theory. In practice. I move from point A to B. And if this is New York and not London. We drive cars on the right. Not the left. Walk on the right. Move quickly from A to B quickly. The only obstacle will be one more khaki-clad gang of tourists standing around, map in hand. Dispense your civic duty; direct the tourists, scatter them on their way. And then move. Keeping to the right. Imagine; we are all in the airport moving along on a giant motorized sidewalk. And if I thought it went without saying, I wouldn’t be saying it. The same goes for the subway. 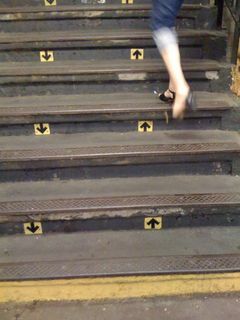 In Brooklyn, they prompt with arrows. Save a girl some trouble. Don’t send me out pre-dawn with a yellow can of paint and a brush. Amen! The pedestrian pictured is showing us all how its done, but can a subway stair-climbing New Yorker really have such skinny calves? Fell out of bed feileng down. This has brightened my day!